Sales volume across all merchant stores. 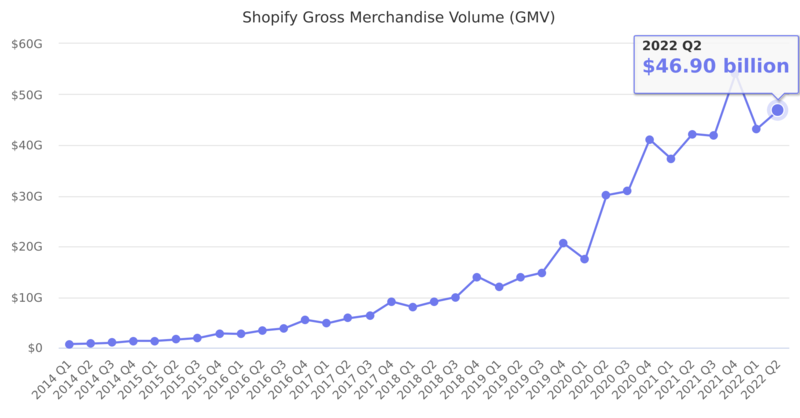 The total dollar value of orders processed on the Shopify platform in the period, net of refunds, and inclusive of shipping and handling, duty and value added taxes. Last reported quarter 2018 Q4 it was $14.00 billion, up by 54% year-over-year from $9.10 billion. From $26.10 billion in 2017 it increased by 57% to $41.10 billion in 2018.